Home | DMX LED Controls | DMX Signal Cable, XLR5 Male to RJ45 - 36"
DMX Signal Cable, XLR5 Male to RJ45 - 36"
This is a DMX signal Cable with a XLR5 male plug on one end and RJ45 jack on the other with 36" of lead wire in between. This cable will allow you to connect a DMX controller that has XLR5 output plugs to our PX24501, PX24600, PX403, PX24500 DMX Drivers, or any other DMX LED Driver with RJ45 connection. Our affordable 1024 Channel U7 DMX Controller comes with PC Software to easily program custom lighting scenes and control your LED Lights and DMX devices away from your computer. Save up to 250 scenes over 5 zones to the U7's 512MB mini SD card. Control up to 341 RGB fixtures or 1024 single color fixtures in stand alone mode, or when connected live to the computer control up to 512 RGB fixtures or 1536 single color fixtures. A built in Ethernet connection allows you to connect your U7 to a home or business network for network control, editing, and smartphone & tablet control. For large installations use multiple units over the network to have control over an unlimited amount of DMX channels. Clock and calender triggering functions are included for triggering of scenes at specific dates and times. The U7 is not limited to only LED control but also can be used for moving heads, fog machines, water jets, fans, or any other DMX compatible device. This really is one of our most powerful and affordable DMX controllers. Software Disk, 5VDC AC/DC converter, and USB to mini USB Cable included. 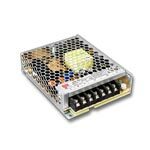 The PX408 4 channel DMX decoder allows you to control 32 amps over four channels of LED Lighting to DMX512 1990 or RDM 2009 Lighting controllers. Use this for any 12-24VDC common anode RGBW lights, RGB LED lights plus one single color LED light, or four single color LED lights, LED modules, or LED light strips to a DMX or RDM 2009 Control System. Includes one 6' Cat5 cable with RJ45 jack connectors. 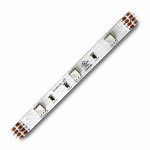 8A per channel with a maximum power of 384W / 12VDC or 768W / 24VDC. Can be connected to DMX512 signal using RJ45 connectors and Cat5 cables or by using the green phoenix terminals for your 3 wire dmx signal. 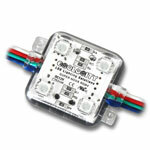 Unit has DIP switches on the side to manually set the starting DMX address of each driver. On power lights will be white until a DMX signal is received, test function will cycle colors when all dip switches are in the on position. Supported RDM parameters: DISC_UNIQUE_BRANCH / DISC_MUTE / DISC_UN_MUTE / DEVICE_INFO / SOFTWARE_VERSION_LABEL / DMX512/ RDM_START_ADDRESS / IDENTIFY_DEVICE / MANUFACTURER_LABEL / SUPPORTED_PARAMETERS. LEDs and power supply are connected using screw down style connectors. RoHs, CE approved. The most popular DMX Driver style PX24500, which allows you to connect your RGB LED Lights, LED Lighting, LED Ribbon strips or RGB LED Modules to DMX512 or DMX1990 Lighting controllers. 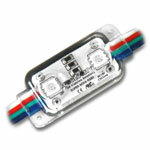 Then by using PWM & DMX, you can change the color and dimming of your RGB LED lights. 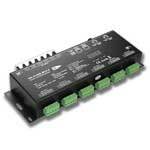 For 12 to 24VDC systems only. Includes one 6' Cat5 cable with RJ45 jack connectors. 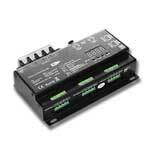 5A per channel with a maximum power of 180W / 12VDC or 360W / 24VDC. For use with 4 pin, 3 loop, common anode style RGB LED and LED Lighting. Can be connected to DMX512 signal using RJ45 connectors and Cat5 cables. Unit has DIP switches on the side to manually change the DMX address of each driver. Each PX24500 Driver uses 3 DMX addresses. RGB LEDs and power supply are connected using screw down style connectors. RoHs, CE approved.